Hope you are enjoying the Navratri Festivities because I am not ...and someone should. Life has been busy and my blog is surviving on pre-drafted posts. So I apologise if I have not been able to keep up with the blog posts of my bloggers friends. But other than that Life is good. Especially because we have a So-Saree Reader post to share today. Today's reader also happens to be family. 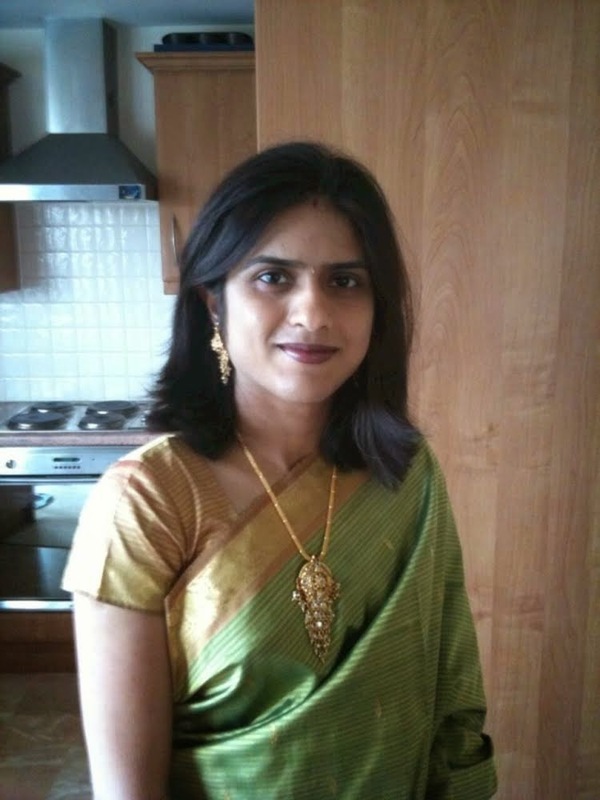 Ruchita Thakkar is my husband's cousin and happens to be an ardent follower of So-Saree. She not only appreciates and encourages So-Saree, but also pampers me with nail art goodies. Thank you Ruchita..Believe me when I say it..I appreciate it from the bottom of my heart. I started reading So-Saree mainly to get to know Aditi. Being globally distant meant that there was hardly any opportunity for the same. However, I soon realized that I started to get hooked to reading the posts on So-Saree and would find myself waiting for a new post always. What has maintained my interest in the blog is variety in topics (travel, nail art, culture, recipes) and the way of writing (straight from heart). The posts are concise and at the same time doing justice to the subject. My favourite post so far has been the one on Autism. I was so touched by Sayuri’s life and in some way inspired me. I love the quick recipe posts as well. Coming back to the purpose of why I started to read So-Saree posts, I feel I had achieved it, as when I met Aditi for the first time, I found her to be, just like I had expected her through reading her posts. I used to write blog posts on recipes (smartandhealthycooking.blogspot.co.uk) which I stopped long while back. Hence, I realise that it is not easy to stay committed to writing in midst of busy schedule. I admire Aditi’s dedication and hard work in maintaining the spark of her blog. I was requested to send my picture in a Saree to accompany this post. But, I am not a great fan at wearing saree mainly because (whether you believe it or not), I have yet to master the skill of draping the saree well and carrying it elegantly as well. Anyways, this picture is few years old taken at a Diwali pot luck party that we were attending at a friend’s place. I would like to end this note by saying a huge thank you to So Saree for giving me an opportunity to write a post. Aditi, you are doing a great job. Keep it up . Keep blogging!!! Happy Dussera To All !!! yay, another saree post ! keep up the saree work coming in .